Canon’s PowerShot SX200 IS a pocket-sized, practical, packed with features and promises much in terms of performance. The Canon’s PowerShot SX200 has one or two interesting design features. It has an aluminium and plastic body which curves inwards on the right-hand side for better grip. On top is a pop-up flash, small power button, large mode dial, shutter button and zoom rocker switch. Multi-controller has functions such as flash mode, macro and self timer button. Surrounding the multi-controller is a control dial, which is used for various settings – more on this later. At the bottom are Display and Menu buttons. On the right is home to a rather tacky plastic cover hiding mini USB and mini HDMI ports. At the bottom, is a flap covering the lithium-ion battery compartment and memory card slot – the SX200 uses SD/SDHC cards, plus several types of MMCs. The Canon measures 103 x 61 x 38mm and weighs 250g with battery and card. 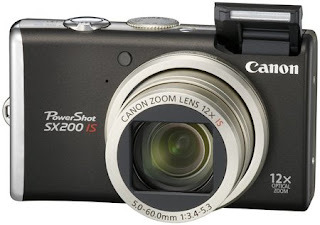 The Canon’s PowerShot SX200 is certainly much more compact than a DSLR. I love that it's more compact than most. Do you know the $$ info? I just purchased one at Costco for $329.00. It's a great camera and takes excellent HD movies.